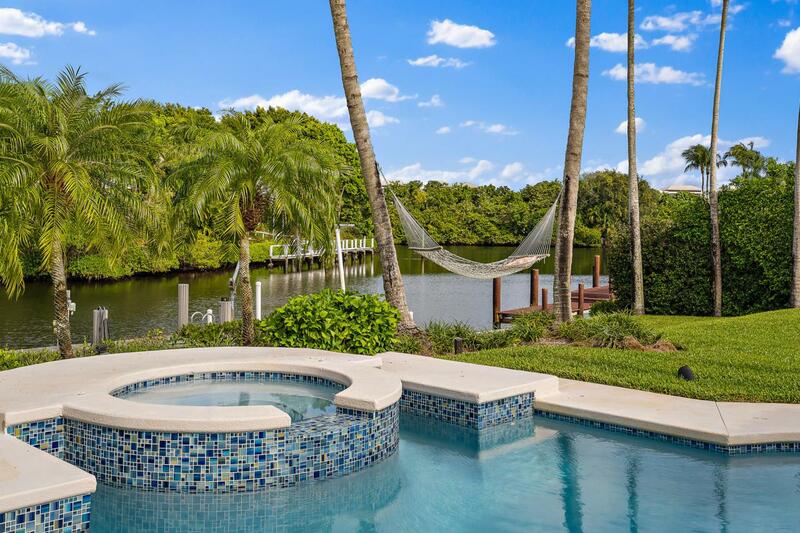 Located on arguably the best street in Frenchman's Creek, this unique estate home sits on more than one-half acre of land with 127 lineal feet of frontage on deep water with a 60 foot wide dock and easy access to the Intracoastal Waterway and Atlantic Ocean. 7,003 SF of air conditioned space with six bedrooms, eight full baths, two half baths, library, media room, exercise room with sauna, 34kw generator, and three car garage, this signature property presents the finest in luxury living in the northern Palm Beaches. Situated in northern Palm Beach County, Florida on 720 acres with 606 residents, Frenchman's Creek is one of the finest luxury communities in the area that boasts 36 holes of championship golf, a 90,000 SF clubhouse, 16 Har-Tru tennis courts including lightedand stadium courts, a state-of-the-art 24,000 SF fitness center with spa, resort style community pool and lap pool, and best yet, a private oceanfront Beach Club.